Doughnut fans, take heed: there's a new spot in town to get your fix. Called The Doughnut Project, the new arrival is located at 912 7th Ave. (between 57th St. & 58th St.) in Midtown West. This newcomer--which has its flagship location in the West Village--specializes in "small-batch, hand-crafted yeast-raised doughnuts," according to a statement on the business' website. 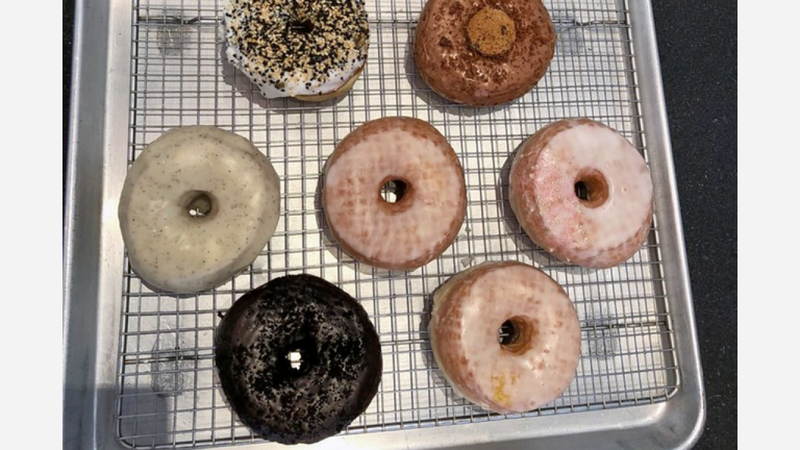 Going beyond the more traditional flavors and toppings usually found on doughnuts, the shop uses sweet, "savory, and sometimes crazy ingredients," the statement adds. The Doughnut Project has already attracted fans thus far, with a five-star rating out of eight reviews on Yelp. Allene T., who was among the first Yelpers to review the new spot on January 15th, said: "The Prosecco doughnut actually tasted like Prosecco, not to mention it was such a pretty doughnut. The yeast doughnut itself was fresh and soft and delicious. This place is going to be dangerous being in my neighborhood. Can't wait to try more!" Yelper Nicole D. added: "Doughnuts are not made on site (they come from the West Village shop). The space is small with no seating. Decor is clean and white, but not as fun as the West Village shop. I didn't get any coffee, but a police officer came in to get one and commented that it was really good." Head on over to check it out: The Doughnut Project is open daily from 8am-8pm.